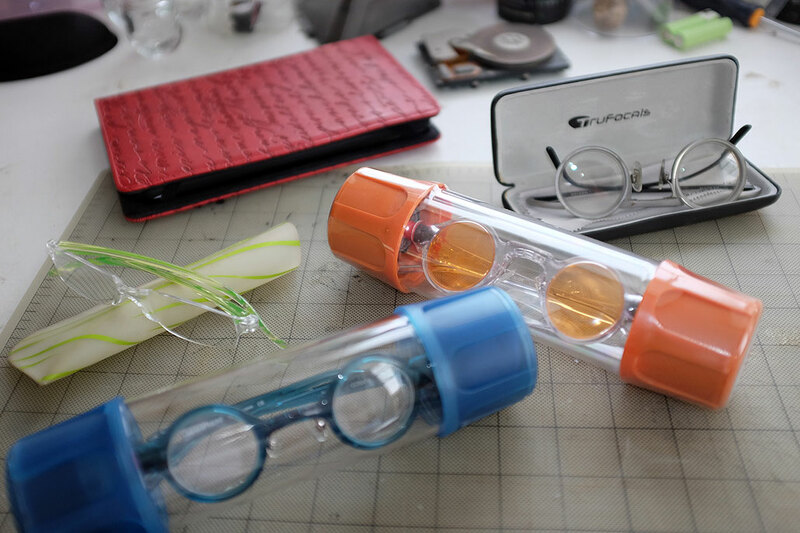 We got a lot of interest in the Superfocus (FirstLook, FirstUse) eyeglasses when we reviewed them three years ago. The Superfocus (formerly TruFocals) glasses worked really well, but we had some complaints about their durability. The frame and prescription lenses held up well with daily use. However, the adjustable part of glasses, even though we were quite careful, still got scratched. The scratches appeared to be on the coating and not on the flexible lens material itself. Still, they made looking though them problematic under certain lighting conditions. Repeated email efforts to Superfocus support to resolver the issue went unanswered. So after a while, we stopped wearing them. This is unfortunate, as we REALLY like them. While the adjustable Superfocus glasses were very effective, they were also relatively expensive. If only there was a less costly alternative. Well, a reader asked us about the Adlens as their adjustable focus works in principle similar to that of the Superfocus. We were intrigued as the adjustable Adlens glasses are between $100 and $160 a pair on the Adlens site. We even found them offered for much less on Amazon . So when a few pairs of Adlens showed up at the office last week we were eager to take a FirstLook!!! Adlens was founded in 2005 by Hong Kong businessman and philanthropist James Chen. The company is headquartered in Oxford England, but have distributors worldwide. The original technology for the Adlens was developed by Professor Joshua Silver, a physicist from the Department of Atomic and Laser Physics at Oxford University, who had been working on a prototype of variable focus glasses since 1998. Over 100,000 pairs of their successful collaboration have been sold to date! The Adlens lens is made of an elastic membrane held in a chamber between rigid front and back polycarbonate plates. When fluid is injected into the chamber (by turning the knobs on the sides), the elastic membrane will bow outwards or inwards, changing the power of the lens. It is extremely quick and simple to do and DOES NOT require a visit to the eye doctor. Also, each lens may be adjusted independently. So, with almost a 5X price difference between the Adlens and the Superfocus, what are wearers giving up if they went with the Adlens? Well, the Adlens will ONLY adjust for near/far-sightedness, and not any optical abnormalities such as astigmatism. 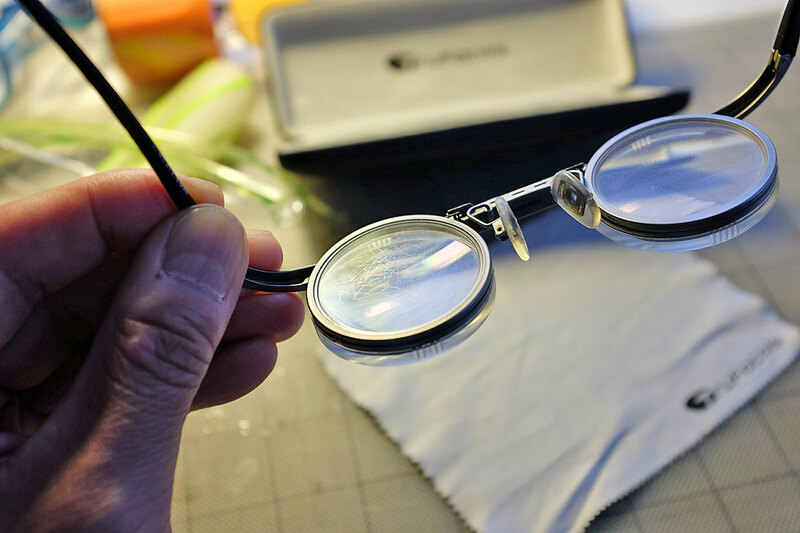 The adjustments are permanent once the knobs have been removed (at which point the glass look like normal glasses). Finally, the Adlens is only able to correct a range of spherical errors (from -4.5D to +3.5D). Still, pretty amazing considering. 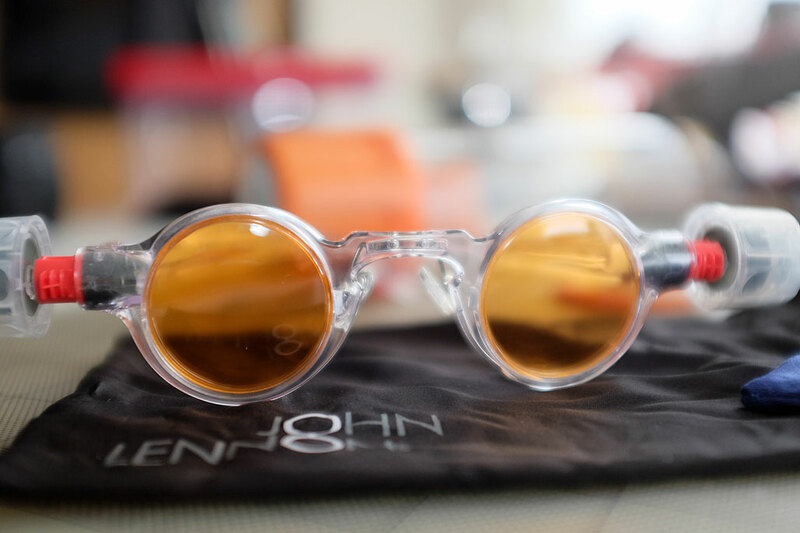 The two Adlens we have in-house are the John Lennon (clear frame/orange color lenses) and the Hemisphere (blue frame/clear lenses). These two frame styles come in a lot of different colors and lens combinations. The John Lennon is so named because the frame is patterned after the round frame made iconic by the famous Beatle. You know, we kind of like the knobs sticking out on the sides! We may just keep them that way for a while 🙂 Besides, we like the idea of being able to readjust the focus whenever we like. We will wear these around the office for the next few months and report back on what we think of them. 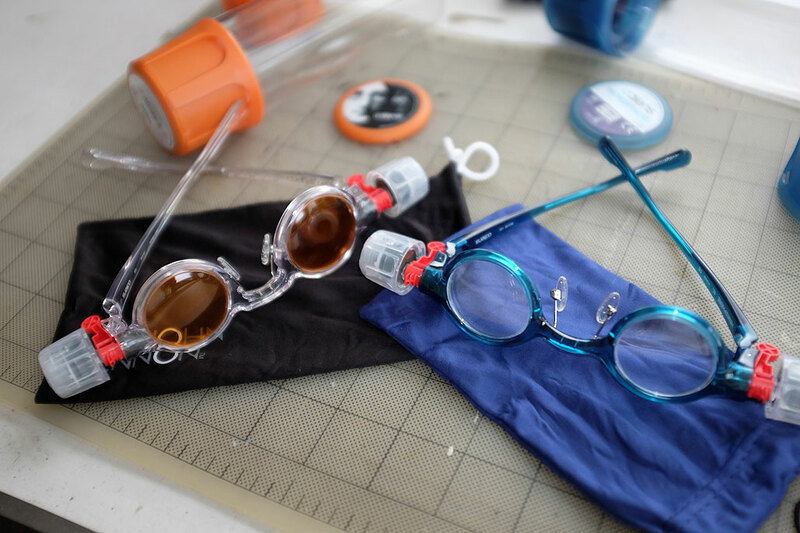 NOTE: For every pair of Adlens glasses purchased, the company donates a pair to someone in the developing world as part of its Buy One Give One program. Distribution of the glasses is administered by Vision for a Nation, a charitable foundation with the goal of providing universal access to eyeglasses, one nation at a time, starting with Rwanda.